What can I say about thus amazing race that hasn’t already been said? I’ve read so many awesome reviews, comments, posts and recaps. It seems this race just does not fail to deliver a first rate, amazing experiences to runners from all over the world. Here is my experience along with a few photos. Back when I first learned that I made it into the race for the second straight year, there was really hardly ever a question in my mind that I would run it. Yes, it’s expensive. $185 just to secure your spot. Then there’s travel expenses, and for me that includes, flights, hotel, food and various other things. I knew it was going to be an expensive affair, but after my amazing experience in Chicago in 2014, I knew I had to go back for more! My flight to Chicago left home early in the morning the day before the race. It was a very easy two hour direct flight that landed me in Illinois at 8:30am. I had been toying for quite some time about if I would attempt to just go directly to my hotel and try to check in, or to go directly to the race expo and get it out of the way. 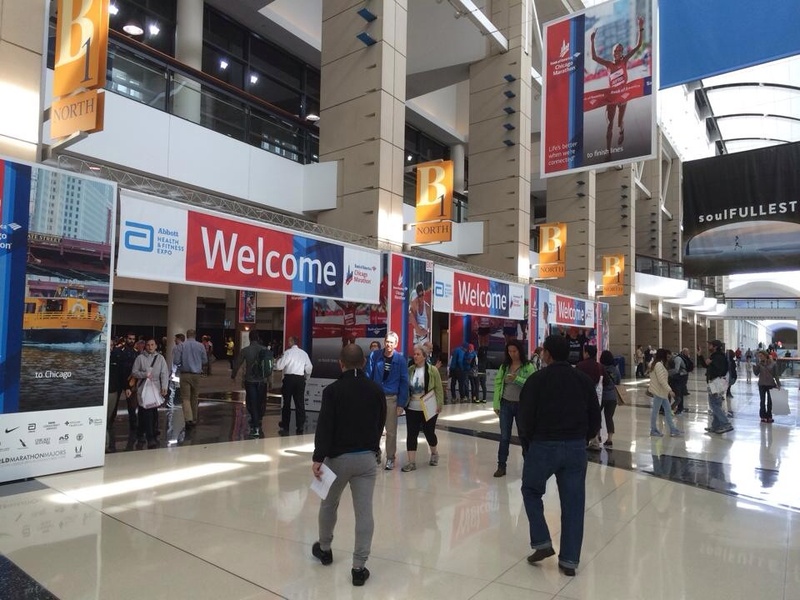 Since I was just using train service again this year, I figured it just best to go on straight to McCormick Place and breeze through the expo. We took the Orange train from Midway to Roosevelt, and then hoofed it about 1.6 miles lugging along baggage and carry-ons. That was a mistake. It didn’t look that far on the map. Should have taken the Green line south one stop, but didn’t. Lesson learned if I go back to Chicago for a third time! The expo hadn’t been open that long on Saturday when I arrived, but it was packed to the gills. A huge expo, but such an amazing set-up. So easy to pick up bib and timing chip, with a full walk through the convention center to grab race shirt and bag. I was actually impressed with the shirt this year. Last years was gray, and a bit lackluster. I ended up choosing to wear last years shirt for the race this year, and painted my name on it. I wanted to be cheered for! Here’s a look at my race day shirt and bib. 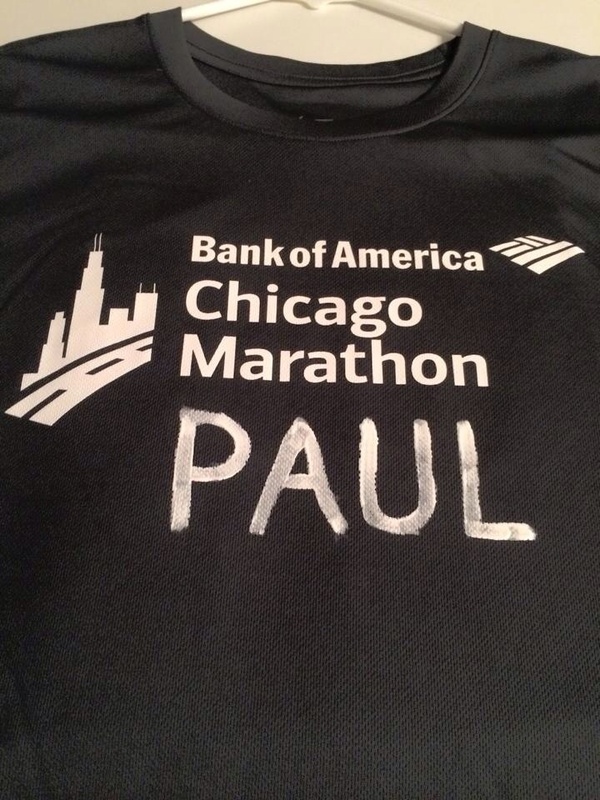 I also painted “Lucky 21” on the back, since this was my 21st marathon. You’ll get to see this years race shirt with my medal at the end of the post. ;). Since I spent a fairly significant amount of time at the expo last year, I really didn’t have a need to shop around or look at much. I wanted to get out fairly quickly and get on to the hotel. A three block walk from the convention center, we hopped on the Green Line train and headed to the Hampton Inn Downtown. So close to the action, and so convenient. 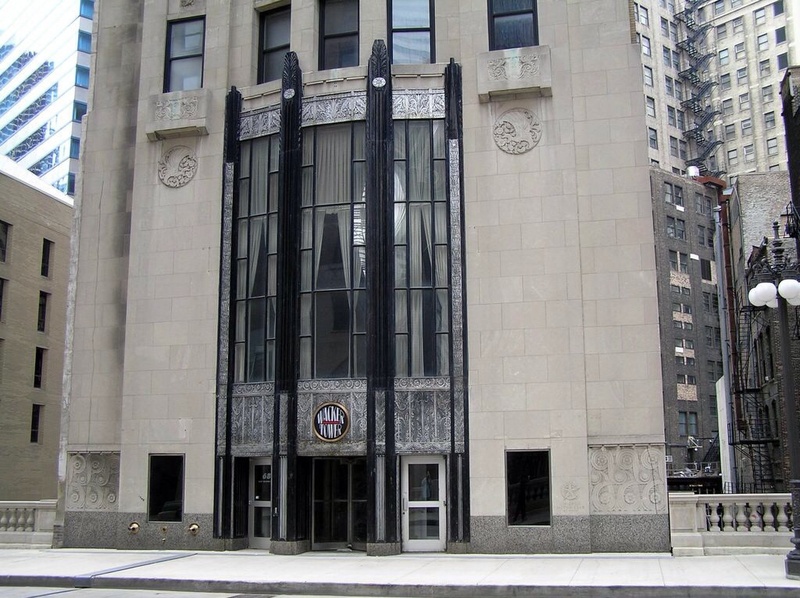 The building used to be the home of the Chicago Motor Club. It was built in 1928, and has recently been renovated and now my hotel for the weekend! 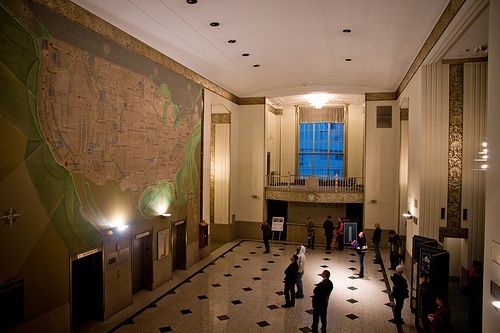 Most buildings in Chicago are quite historic, and the we had a room on the top floor, with amazingly tall ceilings. It was very comfortable. Luckily they were ready for us to check in even though we were several hours early. Once we successfully check in, and changed clothes, it was out to explore Chicago, and grab some grub! 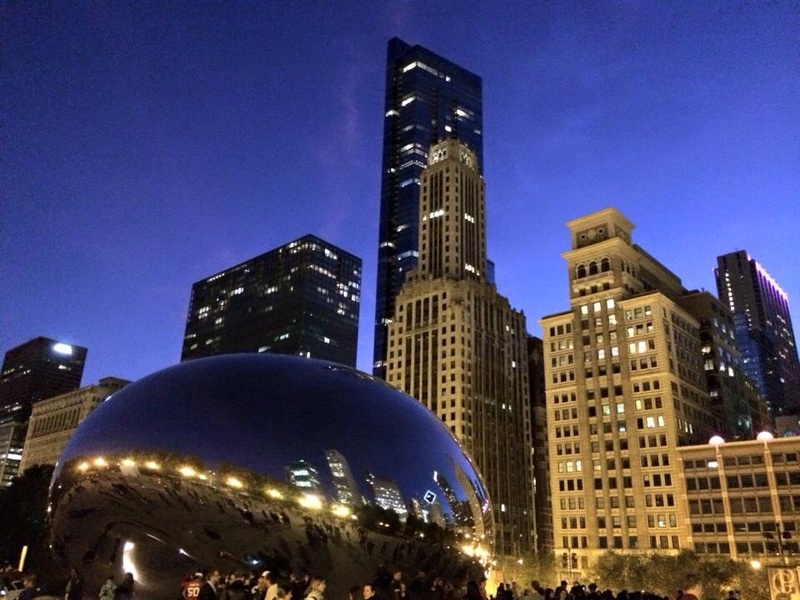 What food do you think of when you think of Chicago? Deep Dish Pizza, right? Well yeah! 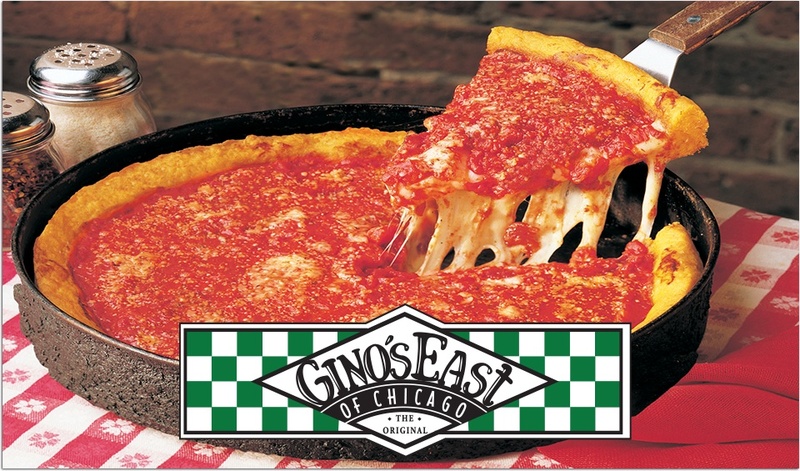 We headed out for Gino’s East. Never ate there last year, so it was the first stop! Man, oh man! They had the most amazing sauce I think I’ve ever had. I filled up quite well I do have to say so. With a fully carbed up system it was time to do some more walking. Magnificent Mile is always fun, and we wrapped up the walking tour with a trip to Garrett’s Popcorn. Certainly a Chicago institution, and always a highlight of my trips to Chi-town. I think it was about 6pm when we headed back to the hotel for the night. No, I wasn’t up late. Marathon morning was a mere hours away, and I needed to get my feet up and rest. If I am remembering correctly, I think I got up at 4:15am on Sunday. Since I had fallen to sleep around 9pm the night before, I felt completely refreshed and ready for the marathon ahead. I had been hydrating like fiend for days in anticipation of the warm temperatures that were predicted for race day. I went down to the lobby, and stepped outside for a quick glimpse. It was warm. There’s always a breeze, if not full on wind in Chicago, so it felt pretty comfortable. Tons warmer than last year, I knew I wouldn’t be cold heading to the starting line this time around. With temperatures heading into the high 70’s though in the afternoon, I grabbed a Gatorade before heading out for the race. A simple 10 minute walk had me nearing Jackson Ave., the site of my Corral C entrance. 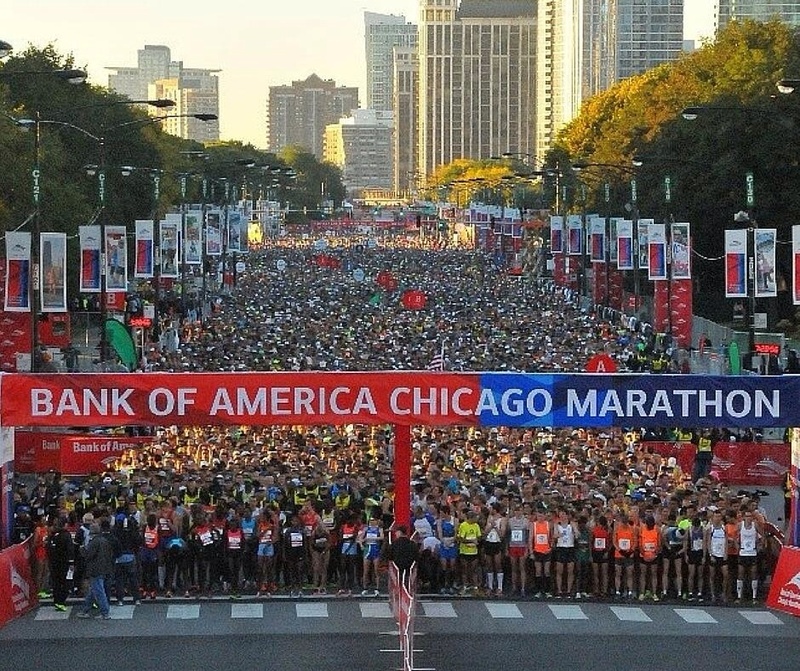 I met a few friends for a photo op, and off we were into a sea of runners heading into Grant Park. The process to get through security is a bit unnerving, as it is a bottleneck until you pass through the security check points, and on into the park. I never felt like I needed to use the bathroom one last time until I had actually been standing in the Corral for about five minutes. It then became quickly uncomfortable, and knew that at some point I would have to stop to relieve myself. As race time neared there is all sorts of fanfare. The announcer spoke, the National Anthem was sung, and before you knew it we were off. Off and running one of the biggest races in the country. The feeling really is quite electric. My goals for the race were really kind of vague. 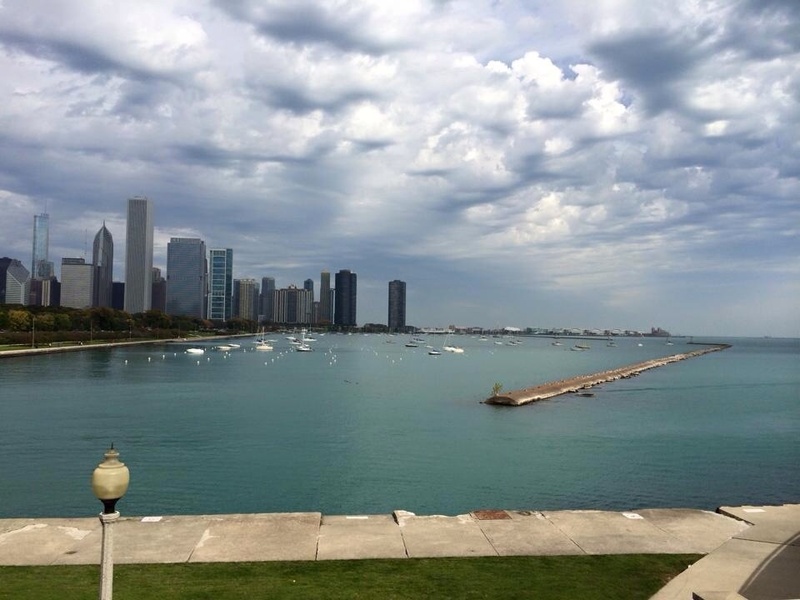 Chicago was my “gotta do it” race for the Fall season. A race where I didn’t really have any concrete plans for finish time or pace, I really just wanted to really soak in the experience and enjoy the crowds. Hence, the reason I painted my name on my shirt. With 1.7 million spectators lining nearly every inch of the course, I think I heard my name chanted no less than a few hundred times. It was amazing! 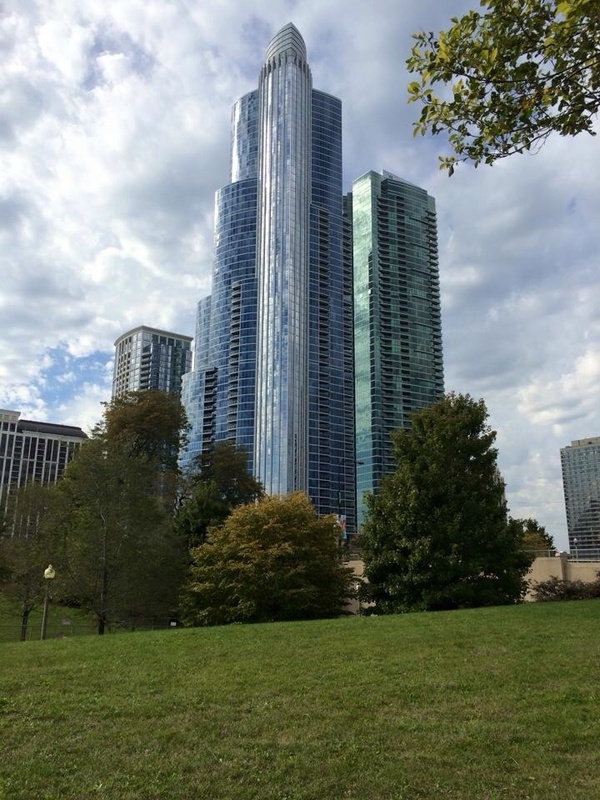 The race course in Chicago is really unique. You get to see everything! North, South, East, West. 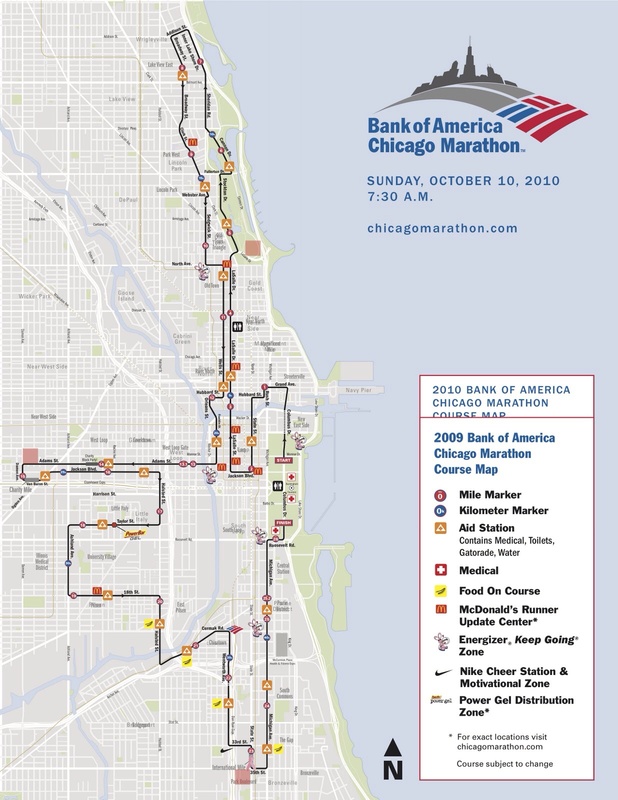 Yes, this is an old map I found online, but it’s the same course we ran. I felt good the first few miles, and thought I would be happy finishing under my time from 2014, but I knew as the day heated up, it would probably be tough to better my time this year. I really didn’t care. I opted to set a goal early on in the race to beat 3:50:00. I knew the type of pace I needed to run, and I would stick with it. The trip though downtown is amazing, the miles ticked by. Lincoln Park came into view, and the trip north. I felt good, but I was already warming up. 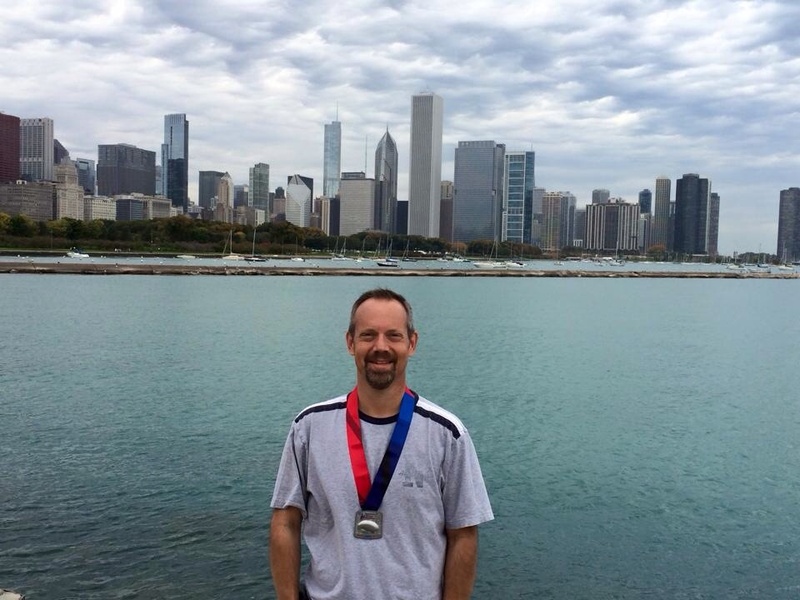 My pace felt slow for the beginning of a marathon, and I knew I just had to keep even, but have fun. The sights, the sounds, the smells of each neighborhood is such an amazing experience. Unique and special. It really was amazing how quickly the first half of the race had come and gone. I felt good. My legs were good, and after I finally found a portolet, I knew I could just run. As the temperatures rose, so did my sweating, Everyone was sweating. I knew I had to make full use of the aid stations so that I didn’t put myself in harms way. I DID NOT want any legs cramps. Not in Chicago! Not this race. 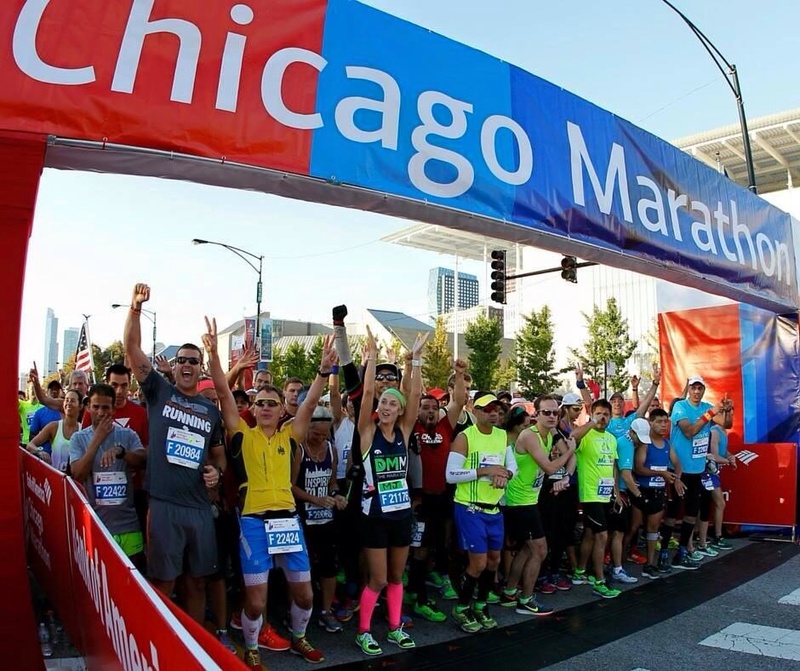 My last marathon in July had been filled with miles and miles of debilitating cramps, and I was not going to let this happen to my Chicago Marathon. Taking aid every two miles I know cost me some time, but it had to be done. I think every time I passed a medical station there were folks being attended to. I was too warm for a marathon, and I had to take this into consideration. I love the hell out of this race though! The crowds were amazing. Certainly a highlight for me. I trodded along, slow at times, but enjoying myself. I would make it to the finish! This, I had to keep repeating to myself, once I hit mile 20. I felt the WALL this time. It was the heat. Normally I can push thought a race without much of a thought about hitting the wall, but this one did me in. It was a huge mental and physical struggle that final 10k. I just kept saying one mile at a time. One mile at a time. Eventually you’ll get there. My focus was now to keep going to beat that 3 hour 50 minute mark. It really kept me going. I would never give up, but my body kept telling me to walk. I wouldn’t do it! I would not walk. I was rewarded for my efforts when I made the final turn and saw the cheering fans in the stands. I had done it. Two Chicago’s in a row. My finish time? 3:49:38. About eight minutes slower this year, but I didn’t care. I grabbed that medal, and wore it proudly the rest of the weekend! I earned that medal! I earned that finish time. My splits? Yeah, completely affected by the day warming up as I ran. Here are a few pictures from the rest of the day, and next before I flew home. 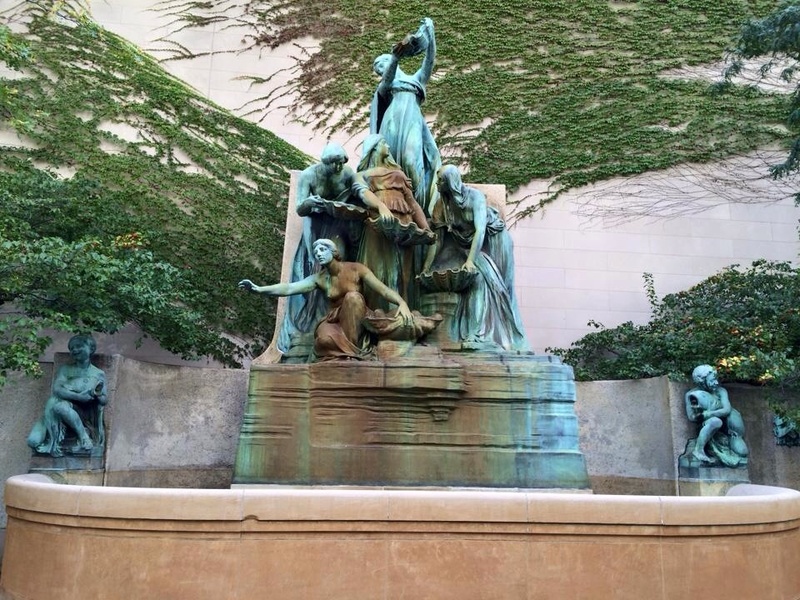 Another epic visit to Chicago! My shirt and medal photo! 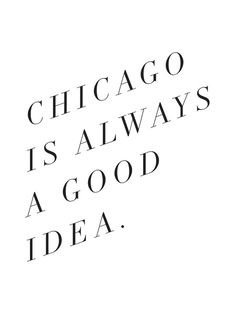 Drinking a cup of coffee on my porch on a crisp and cool morning here in North Carolina, every thought in my head revolves around Chicago. As I listen to the birds, thoughts are swirling in my head about what to pack. At long, long last, after seven days straight at work, I am finally on mini vacation! I ran my last taper run last night, and my body feels good. Today is all about the preparation. Laundry to do, packing must be done. 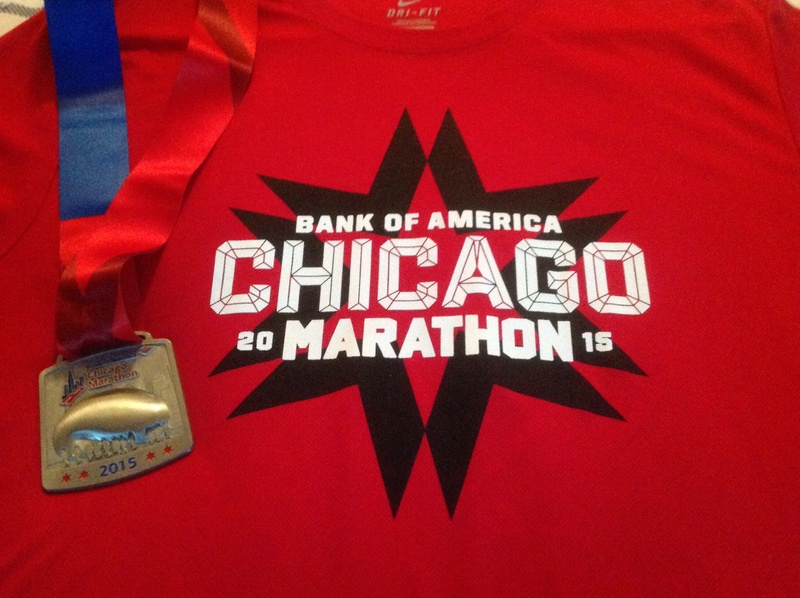 I think I am actually going to run in my race shirt from last years Chicago Marathon. Why not? I usually don’t repeat races, so it would be a great chance to get some use out of it. Our plane takes off tomorrow morning bright and early so today is all about tying off lose ends, packing and relaxing my feet. Two days without running will get me to the starting line feeling fresh and motivated. I haven’t decided if I will head straight to the expo once our plane lands or if I head there later in the day. Starting in Corral C, I can’t wait to pick up my bib! 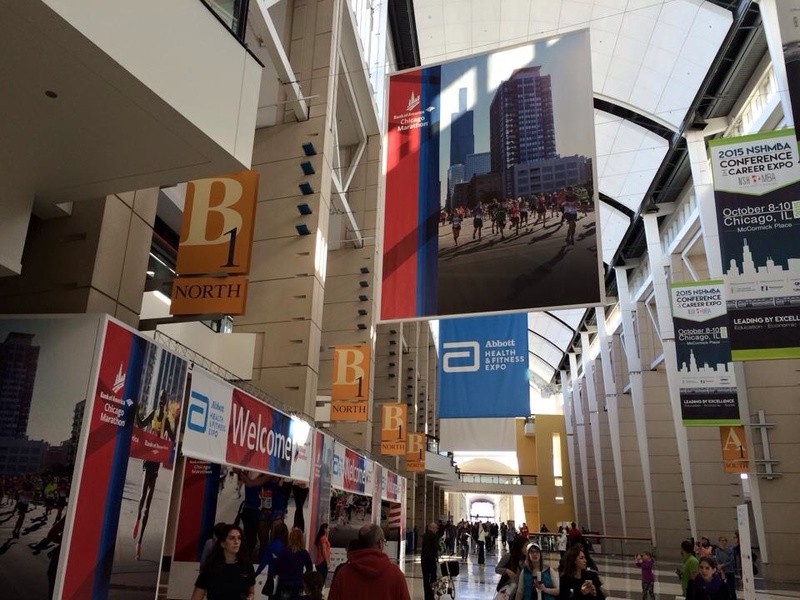 The Chicago Marathon Health and Fitness Expo is truly an amazing experience. 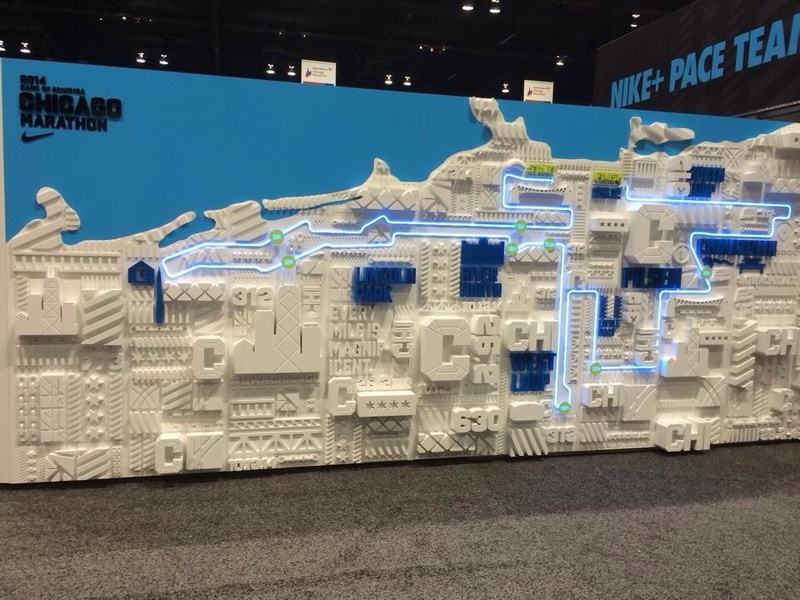 If you ever need to get motivated to run 26.2 miles, visit this expo! Since I ran Chicago last year, many of the “first time running a race” logistical nerves aren’t with me this time around. I now know the city, know where I’m going and know how to navigate where I need to be and when. It will be much more calm this time. It’s probably why I haven’t even started packing yet. This marathon gig, this destination race gig is so much more comfortable now. I never quite know at the beginning of each year, how my race schedule will develop. Of course I have certain races already paid for and a good rough sketch of the year ahead, but how those races pan out always depends on health and injury, work schedule, travel budget, etc.. Then you have to factor in races where just to get in you have to enter a lottery. You can never plan too far in advance if you’re even considering an event on your calendar that requires a lottery to get in. 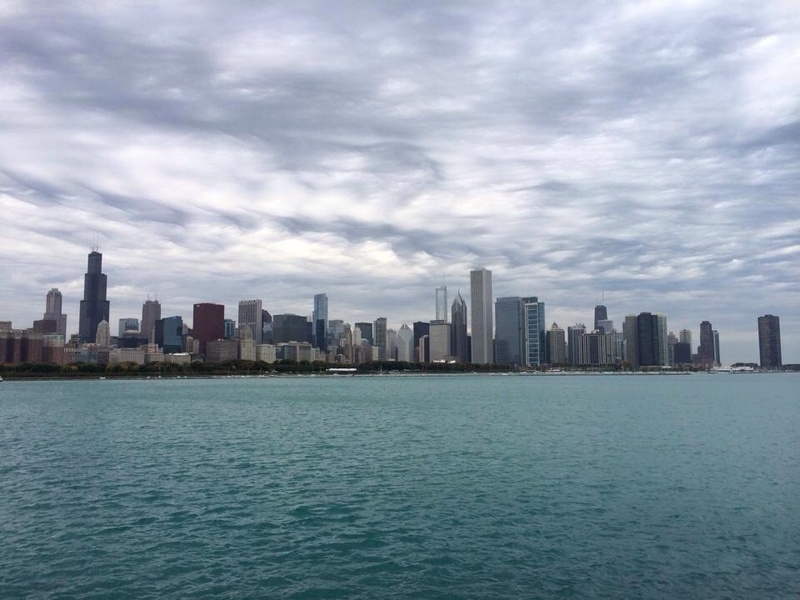 I was lucky enough to make it into Chicago again (two years in a row), and I never even started second guessing myself on if I should run it again. Once I knew I made it into the race, I signed up for the race. 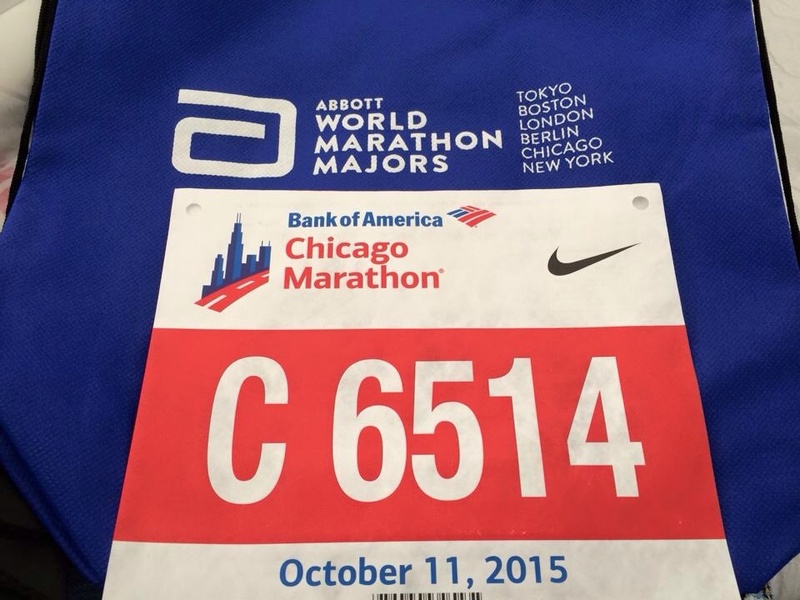 The Chicago Marathon on Sunday, will be my 21st marathon! Lucky 21! I can barely contain my excitement! I have been so blessed all throughout this marathon running journey I’ve been on. I do feel very lucky to even have made it to my 21st marathon. It’s only fitting I get to call this Chicago Marathon my 21st. Back in Myrtle Beach 2012, as I toed the line for my first marathon, a thought of ever reaching twenty more marathons never even crossed my mind. I am so fortunate that my, now 45 year old, body has withstood the test of marathon running to this degree. 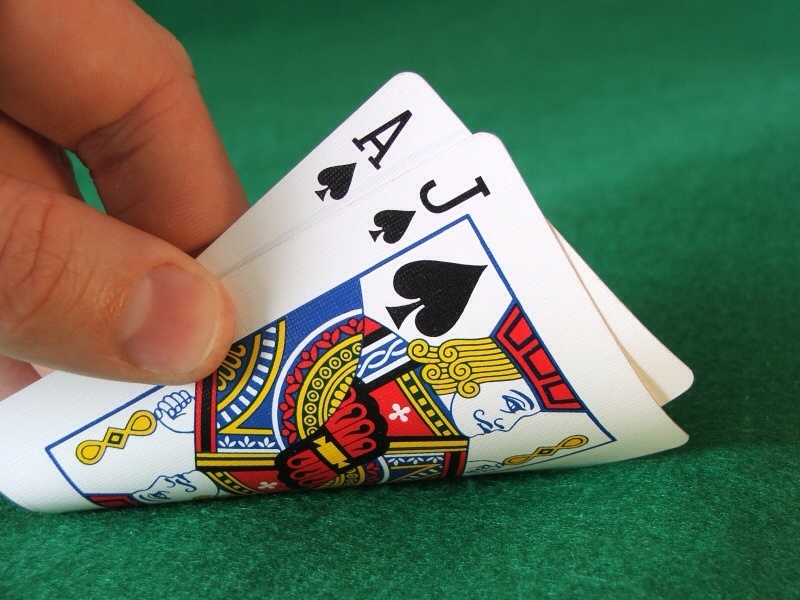 It’s time for the dealer to shuffle the deck, and deal me my Blackjack in Chicago! 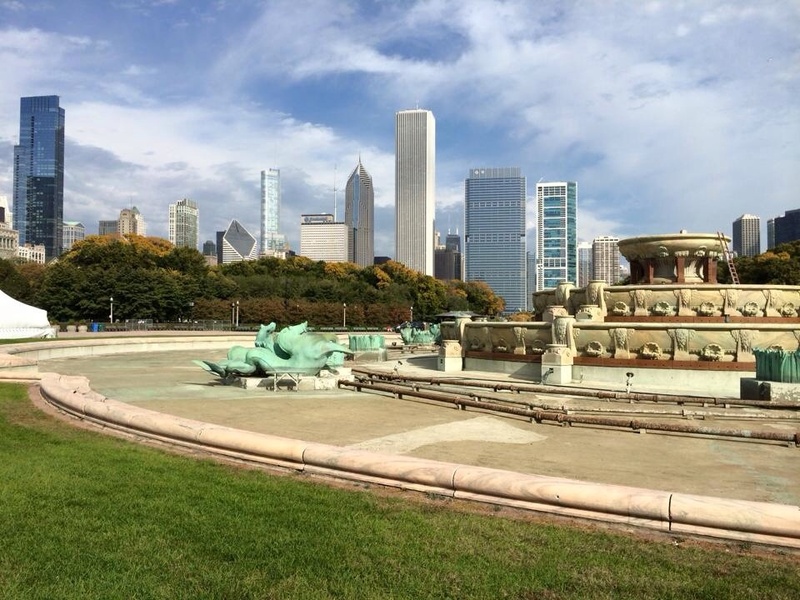 I had the most amazing time last October in Chicago. It was my first ever trip there, and I enjoyed every moment. 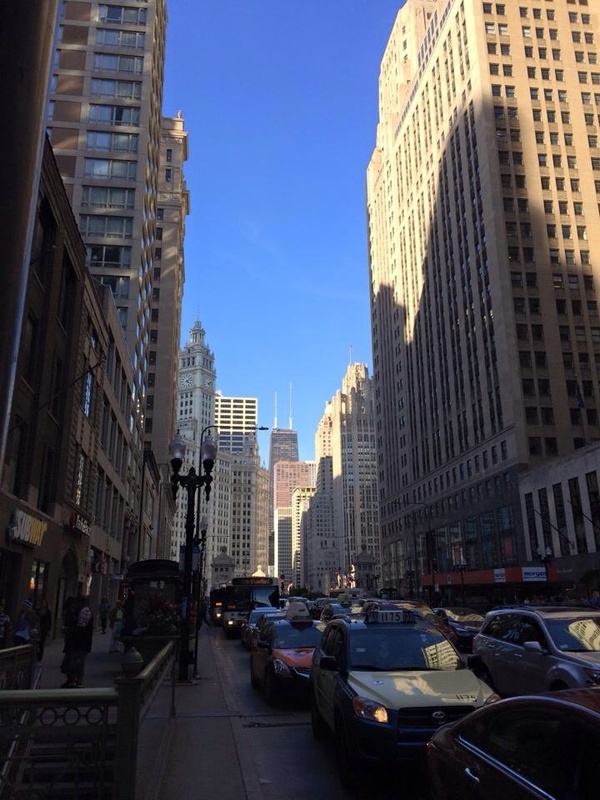 Walking around the city, taking in the sights, the Pier, Magnificent Mile, everything! The food? Oh yes! The Donut Vault, Lou Malnati’s Pizza, Garrett’s. All highlights for the foodie in me. The reason for my trip last year was the marathon, and what an amazing race it was! I enjoyed every moment of it, from beginning to end. 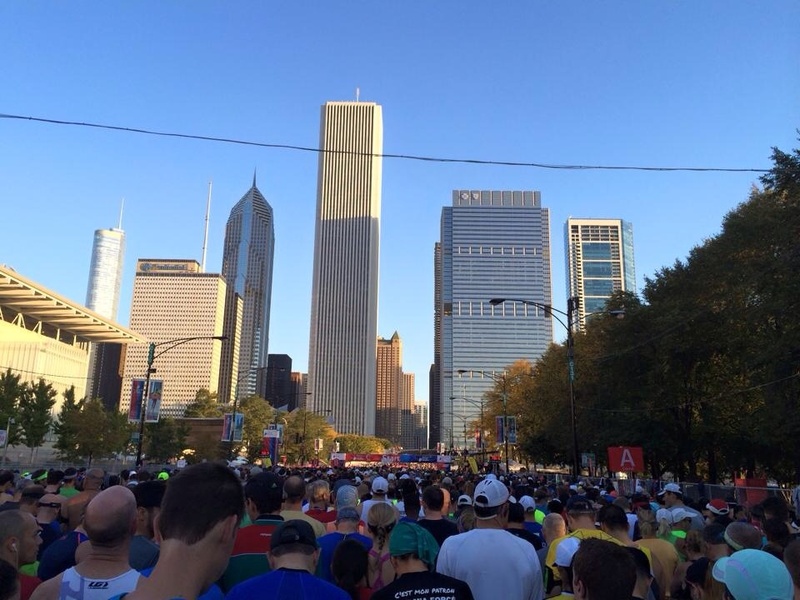 I remember thinking at the time that I would go back to Chicago to run that race every chance I had. Well, I made it through the lottery again this year. I found out last week. As of right now, I still haven’t confirmed my registration. The deadline for me to sign up is tomorrow. Why have I delayed signing up? I want to make sure I can afford the trip again. I am dying to just go to the website right now and complete my registration, but I must be sure. I’ll be shopping around for flights this morning, and making sure I can take the time off at work. I will decide by tonight. This decision should be a no-brainer, so why isn’t it? One answer, MONEY! I am being adult by taking my time thinking this through first. Have you ever had a hard time trying to decide on a race? 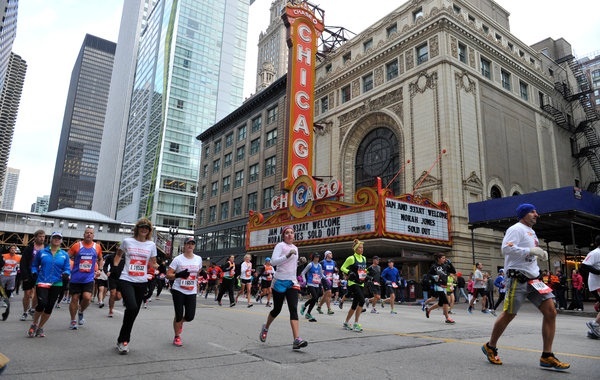 The Chicago Marathon is calling me! 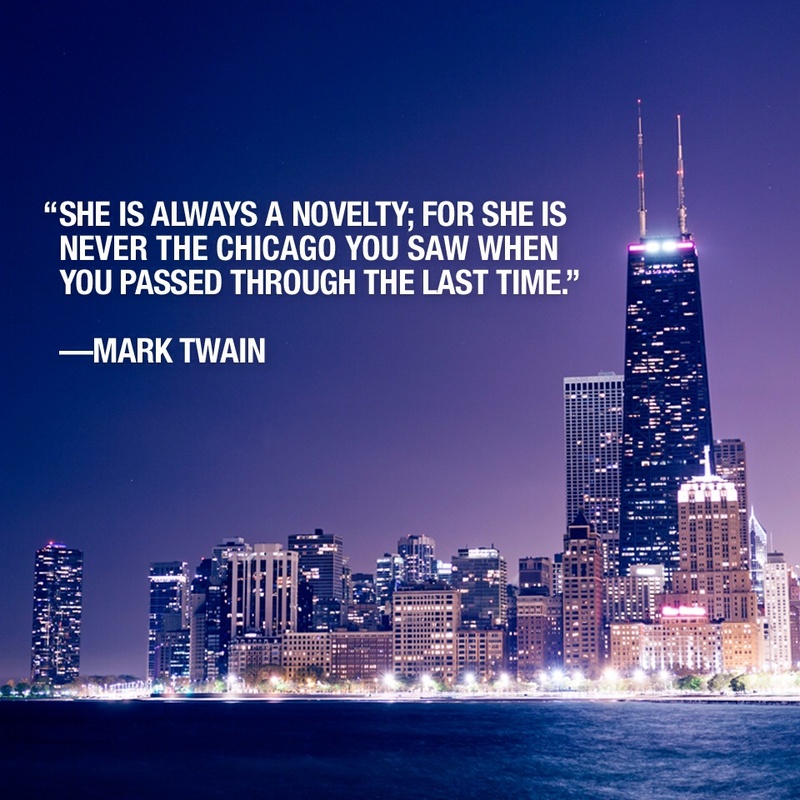 Chicago is awaiting my return… And I want to go back!